This copper magnetic therapy bracelet has a mesmerizing design. 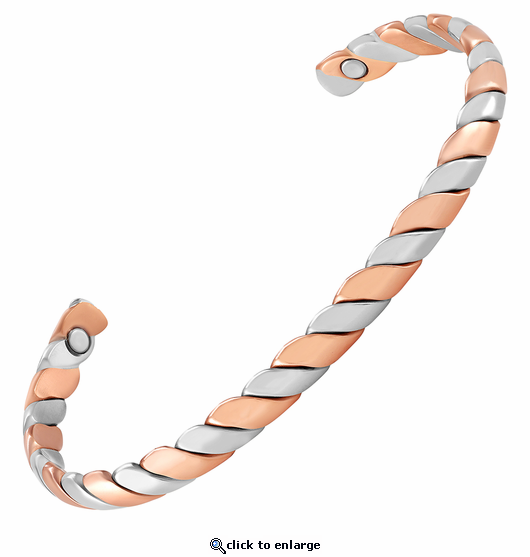 Styled in copper and silver twisted solid metals, this magnetic bracelet has 2 powerful 3000 gauss neodymium rare earth bio north facing magnets and stainless steel magnet caps for added durability. It is made nickel free with only solid metals made from pure copper and no color plating. Slender at about 1/4" wide, this is an awesome looking therapy bracelet and the picture does not do justice. Very nice light weight beautiful bracelet. It looks to be very well made out of really nice meteral. I love the jewelry and can tell a difference in my thumb joint. I liked it so much, I gave one to my fianc for his wrist that bothers him when he plays golf.